A look at the map shows that Iran is completely surrounded by American troops on land and water, notes an energy investment analyst. Kuwait, which is heavily armed by the U.S. and is home to American bases, is located on the southwestern border of Iran. The country’s western neighbors are Turkey and Iraq, also home to American bases, and Turkmenistan, the Caspian Sea and Azerbaijan are the Islamic Republic’s northern neighbors. The U.S.army last year advanced military cooperation with Turkmenistan. An independent Caspian news agency has confirmed unusually heavy activity of American troops along the border with Iran. The Iranian Revolutionary Guards' Brigadier General Mehdi Moini said last week that his forces increased patrols, including tanks and anti-aircraft units, along the border with Azerbaijan because they noticed increased American activity. Iran charged that Israeli forces were also present, sparking a virtual war alert among the Iranian Guards. In addition, the Times of London reported earlier this month that Saudi Arabia has agreed to open its air space for Israel Air Force jets, a claim that the Saudi monarchy denied. It similar denied Iranian news agency claims that Israeli helicopters unloaded military equipment at a northwestern Saudi Arabian air base, from where Israeli planes theoretically could reach Iran in the shorts possible time. There has been no confirmation of Israel-Saudi cooperation from any other source, but one IDF reserve officer, who has been involved in secret military projects for private companies, told Israel National News that the it could be true if both countries found it in their common interests. Saudi Arabia does not recognize Israel and has treated the Jewish State with disdain. 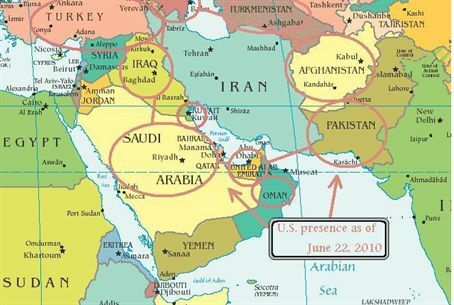 However, the possibility of Iran's dominating the Arab world with nuclear power has changed all political scenarios. Several defense websites have reported that Israel is deploying one to three German-made nuclear submarines in the Persian Gulf as a defensive measure against the possibility of a missile attacks from Lebanon and Syria, as well as Iran. Amid the buzz of increased military activity around Iran looms the specter of higher oil prices, which is DeHaemer's field of expertise. “The last oil price shock in the Middle East was in 1990 when the United States invaded Iraq for invading Kuwait. The price per barrel of oil went from $21 to $28 on August 6...to $46 by mid-October. The looming Iran War is not priced in,” he warned in his news letter. Iran has the third-highest oil reserves in the world and is second only to Saudi Arabia in production. If any action prevents the flow of Iranian oil, the price of “black gold” would soar, he added.